Lehrte, Dezember 5th 2017 — For track-guided automated guided vehicles (AGV) transponder systems (RFID) for the identification of fixed positions are indispensable. 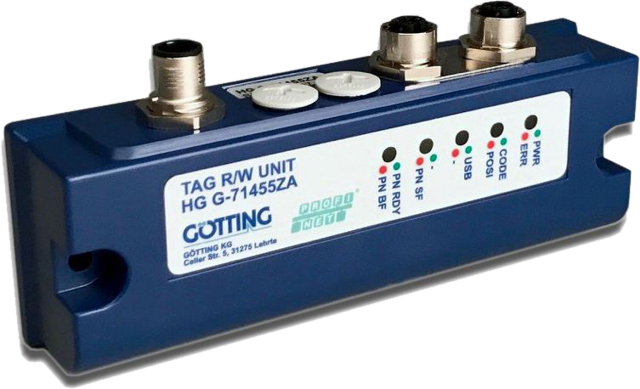 Götting has added the antenna version HG G-71455-A to its model range of transponder-antennas. In order to make it easier to connect the antenna to modern PLC vehicle controllers it comes equipped with a Profinet interface. Additionally versions with a serial interface, Profibus or CAN bus are available. The new antenna is compatible to the other models and can be operated in conjunction with the transponder types HG G-71325 or HW DEV00033/34. For the retrofit of existing facilities it can also be used with the transponder types HG 71310/20. The output signals — as is common for Götting antennas — include the 16 bit transponder code and the positioning pulse (PosiPulse, center crossing signal). With this antenna Götting broadens its industry leading range of track guidance, navigation and positioning technologies enabling the company to offer components for more applications for automated guided vehicles (AGV).